Islam News Room - Blackwater: Now Called XE - Are They Terrorists? Blackwater: Now Called XE - Are They Terrorists? Now they call themselves "Xe" (pronounced "zee"). Did Bush's C.I.A. pay this private militia to torture, frighten, terrorise and kill? Report says, "C.I.A. gave the orders, they just pulled the trigger.."
Founded in 1998 by former Navy Seals, Blackwater Worldwide says it has prepared tens of thousands of security personnel to work in hot spots around the world. But it was an incident in Baghdad in September 2007, in which Blackwater guards killed 17 Iraqis, that brought the company to public notice, and made it a focal point for tensions over the role of the many private security firms supplementing the American war effort. In 2002, Blackwater won a classified contract to provide security for the Central Intelligence Agency station in Kabul, Afghanistan, and the company maintains other classified contracts with the C.I.A. Over the years, Blackwater has hired several former top agency officials, including Cofer Black, who ran the C.I.A. counterterrorism center immediately after the Sept. 11 attacks. C.I.A. operatives regularly use Blackwater's training complex in North Carolina. In 2004, the C.I.A. hired contractors from Blackwater as part of a secret program to locate and assassinate top operatives of Al Qaeda, according to current and former government officials. Blackwater executives helped the spy agency with planning, training and surveillance, and the C.I.A. spent several million dollars on the program, which did not successfully capture or kill any terrorist suspects. In June 2009, alarmed by the agency's use of an outside company for the program, Leon E. Panetta, the C.I.A. 's director, called an emergency meeting to tell Congress that the agency had withheld details of the program for seven years, officials said. The C.I.A. did not give the Blackwater executives a "license to kill," though, officials said. Instead, it directed the contractors to collect information on the whereabouts of Al Qaeda's leaders, carry out surveillance and train for possible missions. But government officials said that bringing outsiders into a program with lethal authority raised deep concerns about accountability in covert operations. Blackwater's work on the program ended years before Mr. Panetta took over the agency, after senior C.I.A. officials themselves questioned the wisdom of using outsiders in such a program. The C.I.A. did not have a formal contract with Blackwater for the program; it had individual agreements with top company officials, including the founder, Erik D. Prince, a politically connected former member of the Navy Seals and the heir to a family fortune. The extent of Blackwater's dealings with the C.I.A. has largely been hidden, but its public contract with the State Department to provide private security to American diplomats in Iraq has generated intense scrutiny and controversy. Iraqi officials had long complained about what they called indiscriminate gunfire by private security forces hired by Americans. American officials said they had no alternative for protecting diplomats, but in negotiations in 2008 over a status of forces agreement with the American military, Iraqi officials were adamant that private contractors no longer have immunity for their actions. 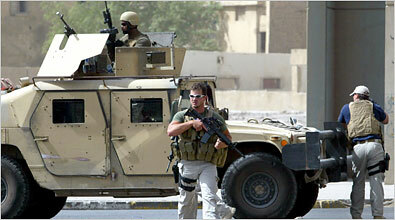 On Dec. 8, 2008, federal prosecutors charged five Blackwater guards involved in the Baghdad shootings with manslaughter. A sixth guard admitted in a plea deal to killing at least one Iraqi. In January 2009, the Iraqi government indicated it would not renew Blackwater's operating license amid concerns of inappropriate use of force. In February, Blackwater announced that it was abandoning the brand name that has been tarnished by its work in Iraq, choosing Xe (pronounced zee) as the new name for its family of two dozen businesses. Most people in and outside of the company still use Blackwater. The company has continued to grow through government work, even as it has attracted criticism and allegations of brutality. From a secret division at its North Carolina headquarters, it has assumed a role in Washington's most important counterterrorism program: the use of drones to kill Al Qaeda's leaders, according to government officials and current and former employees. Blackwater is not involved in selecting targets or actual strikes. The targets are selected by the C.I.A., and employees at its headquarters in Langley, Va., pull the trigger remotely. Only a handful of the agency's employees actually work at the Predator bases in Afghanistan and Pakistan, current and former employees said.